Source: Neptune Chemical Pump Co., Inc. The new Series PZ pulse metering pump is designed for injection of a wide range of liquid materials, including chemicals, nutrients and disinfectants. An economical alternative to Series PX, this successor pump universalizes the design and eliminates the need to change pump models to match the available voltage. 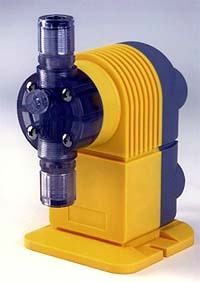 The PZ pump operates on any single phase voltage from 94 VAC to 264 VAC. This series offers a constant chemical delivery and injection, high stroking speed, volumetric efficiency, dial setting accuracy and low feed rates. The number of pulses per minute can be manually adjusted from 15 to 300 pulses. Accessories include a foot valve strainer, a back pressure/check valve injector with quill, suction, discharge and air release tubing. The unit is suitable for outdoor service with its dust-proof, UV and water-resistant enclosure. Neptune Chemical Pump Co., Inc., P.O. Box 247, Lansdale, PA 19446. Tel: 215-699-8700; Fax: 215-699-0370. Neptune Chemical Pump Co., Inc.